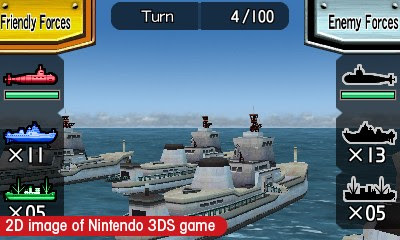 When Nintendo unveiled the Nintendo 3DS at last year's E3 a game like Steel Diver is probably the last type of game you'd think would be a first-party launch title. It's a game that is part submarine simulation, part action-puzzler, part first-person shooter and part multiplayer strategy. Wow that's a mouthful. The obvious question is whether or not Steel Diver is a good game, and the answer is yes it is, but you need to understand what you're getting into first. That's why I'm here to help. On the surface, Steel Diver's main Mission mode will likely come off as a painfully slow and cumbersome submarine game that has you maneuvering your watercraft through bland environments in attempt to reach your goals. The mission goals vary from capturing an enemy base, to navigating a jungle canal, to seeking and destroying the enemy's flagship, but no matter what the objective is the levels play pretty much the same. You begin each mission by selecting one of three submarines, the nimble and light Manatee, the mid-size balanced BlueShark, or the powerful yet slow Serpent. 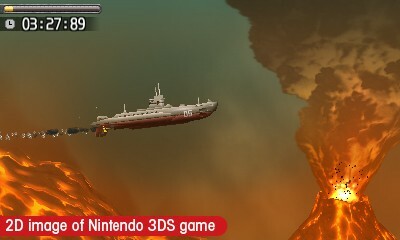 Controlling the subs is done using the Nintendo 3DS telescoping stylus on the lower touchpad. There is a slider for horizontal movement (reverse/forward), a slider for vertical depth (surface/dive), and in the two larger subs there's a pitch wheel that controls the angle of your vessel. Each submarine also has a "Masker" button that is used to pass by homing missiles unnoticed and a "Torpedo" button (the larger vessels have multiple torpedoes) to blast enemies, destroy water mines and remove barriers blocking your submarine. There's also an air gauge that depletes every time you press the Masker button, and your supply can be replenished by surfacing or by finding air pockets in underground caverns. Along the way you'll encounter many obstacles that can diminish your damage meter, including enemy fire, volcanic eruptions and collisions with the ocean floor or underwater surfaces. Bringing your vessel above water also has the added bonus of decreasing your damage meter as your crew repairs the submarine. While the initial few missions are a cakewalk, the challenge ramps up quite quickly and this is where the real joy of Steel Diver sets in. It might sound tedious to have to constantly be adjusting all these sliders to reach your goal, but it's actually surprisingly satisfying to make minute angle and speed changes that result in close-call battle victories and near-miss wall collisions. The Mission mode is quite short unfortunately, only seven missions are included, and considering it's the "meat" of the game you'd think there would be many more. Of course, each mission can be replayed for improved high scores and to clear it with all three submarines, but the replayability is a little thin. Fortunately, in addition to Mission mode there are two other modes to play around with: Periscope Strike and Steel Commander. 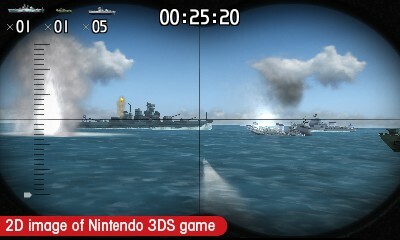 The first mode uses the Nintendo 3DS gyroscope to simulate a periscope and you need to physically turn in a 360 degree motion to search for and sink enemy submarines and battleships. There's really not much more to this mode than that, but like the Mission mode it's surprisingly fun to play over and over again. Finally there's the multiplayer Steel Commander mode which feels like a mash-up of Battleship and Hide-and-Seek and can be played against a computer A.I. or with a friend via download play. Sure I could complain that Steel Diver isn't the Mario or Zelda launch title we were all hoping for, but it's a really engaging submarine simulation game that will hook you with patience. Whether you're eking out a close victory in Mission mode or spinning to find an enemy cruiser in Periscope mode, Steel Diver is simply a lot of fun if you're brave enough to dive below the surface.